Mothers are very important and needed in child life. In our all life we learn different things from our mother. Mothers always teach us and her advice always very beneficial for us so make this mothers day more special and memorable for your mom while gifting this gift combo brings from Giftacrossindia. 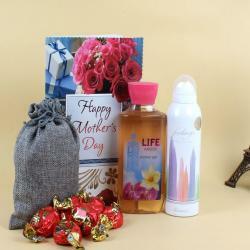 Surprise your mother with exceptional gifts from Giftacrossindia on lovely Occasion like Mothers Day. This is a striking gift set of styling and grooming products for your mother. 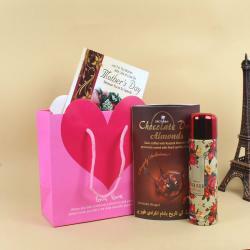 It comprises of a Rasasi Perfume, Free Breath Shower Gel and YC Whitening Honey Face Scrub with Mother Day greeting card. This awesome gift combo is bound to touch his heart with warmth of your love and caring. So order this mind blowing gift for your loved ones and show him how much he means to you. This is a lovely hamper of grooming products for your mom. It has perfume to smell exquisite. It has a body care product to take care of it. This classic hamper is perfect to delight him and express your feelings and also make him happy and blessed. Product Consist: Feeling Rasasi Perfume (Weight: 60 ml), Free Breath Shower Gel (Weight: 295 ml), YC Whitening Honey Face Scrub (Weight: 150 ml) along with Mothers Day Greeting Card.